The visual bar couldn’t be higher when it comes to video games and the marketing thereof. So, to launch Forza Motorsport 5, agency twofifteenmccann combined a car and a camera to create a whole new style of film. We’ve come to the point in video game development where, in many cases, the quality of animation is so high that to an untrained eye the graphics look real. This is particularly true of the motorsport genre where entire games are based on recreating cars and racing terrain to simulate the driving experience, and where there’s some freedom from the burden of creating life-like human characters. This is great news for gamers, but is a bit of a challenge for marketers of such games. People know these games look awesome so putting some footage in a spot just doesn’t pass muster like it used to. So when it came time to promote Forza Motorsport 5, San Francisco-based agency twofifteenmccann decided to do something different. By combining high-tech gear with an old-school filmmaking style the agency turned a McLaren 12C supercar into the world’s fastest camera and a racetrack into living filmstrip. How? By mounting a Phantom Flex camera atop the car with a purpose-built rig, and enlisting pro driver Tanner Foust to race by 680 still frames output from the game at speeds topping 120 mph. The result is “Forza FilmSpeed”, a two-minute film that brings the game to life in the real world. With a great idea in hand, the real question became: was it possible? Looking for expertise, the agency turned to director Jeff Zwart. Known for his extensive experience shooting car commercials, Zwart is also an accomplished and active racecar driver and his intimate knowledge of the Barber Motorsports Park, where the commercial was to be shot, helped determine how to make the idea work. 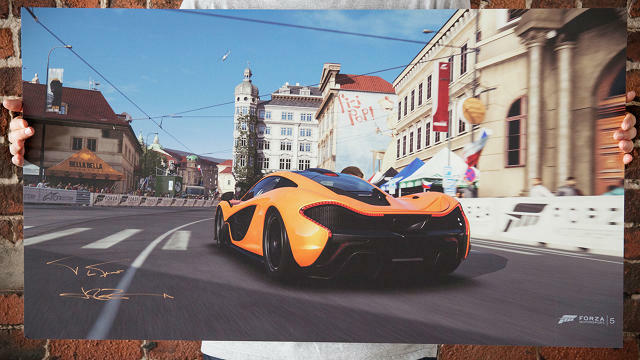 The game stills at trackside were output directly from Forza Motorsport 5, which, with its amazing fidelity, produced super-high resolution, art-like images (60 of those frames have been given to the top online Forza players around the world). To capture those images, Duchon says they went to developer Turn 10 Studios and played the game through hand-chosen sequences. The stills frames were then printed onto aluminum sheets, a process that Duchon says took over 30 days. When it came to actually filming the spot, the process was truly like no other. Zwart placed the still frames in such a way that allowed the car to do full laps, providing different backgrounds and using each of the three straight-aways to the fullest. Since “getting the shot” involved driving a full speed past the frames, the results were varied. “We had to drive basically flat-out around the track to get to the speed with all the equipment and myself in the car. Then we’d have to hold it for as long as you possibly could,” says Zwart, noting the addition of considerable weight to the carbon fiber car altered its usual performance. “It’s one thing to hit the speed, it’s another thing to hold the speed.” If the car passed the frames too fast or too slow, the image captured by the camera would be blurred and would seem to drift either right or left. The car’s speed also determined how much footage was captured with each pass. “Sometimes, if we didn’t get a good exit out of the corner or we tried some other variable, we’d only capture two seconds of game footage. Other times, if it was perfect exit, we could hold for the length of the run,” he says.